As the weather gets colder, nothing beats a baked dessert. Warm sweet fruit, with a crumbly crunchy topping. We both have sweet tooths and let’s be realistic, there are some days when you just have to have a little treat. So when we make sweet treats, we find every way possible to ADD nutrition to the dish. The humble crumble is a well known dessert made on fruit (yes good), lashings of butter, white flour and processed sugar (not so good) and not a lot of anything else (not so nutritious). If you take a look at this crumble, it still contains calories from sugar and nuts but the difference is the ingredients are less processed and actually contain nutritional benefits. This crumble is packed full of fibre from the fruit, nuts, dates and wholemeal flour to promote a healthy digestive system. As a gluten free alternative, simply replace the flour with equal quantities of ground nuts of your choice. We love macadamia nuts and almonds. Instead of sugar, use a low GI minimally processed sugar such as coconut sugar or Rapidura which are available from health food stores and have a delicious caramel flavour. If you can’t find these, use brown sugar. Or just omit sugar altogether if you wish. Adding nuts and seeds to the topping not only increases the fibre, but also provides heart healthy mono unsaturated fats to protect against heart disease, vitamins, minerals and a delicious flavour. This recipe isn’t designed to be adhered to. You can swap and change nuts, use your favourite fruit and experiment with different combo’s. If the mixture is too dry you may need to add a little more oil or spread, 1 tablespoon at a time. The mixture should ‘clump’ together when you squeeze it in the palm of your hand and then crumble apart when you try and break it. Place these clumps gently on top of the fruit within the bowl. Sprinkle each with a pinch of cinnamon. Bake in the oven for 30 mins – 1 hour depending on the size of your dish. 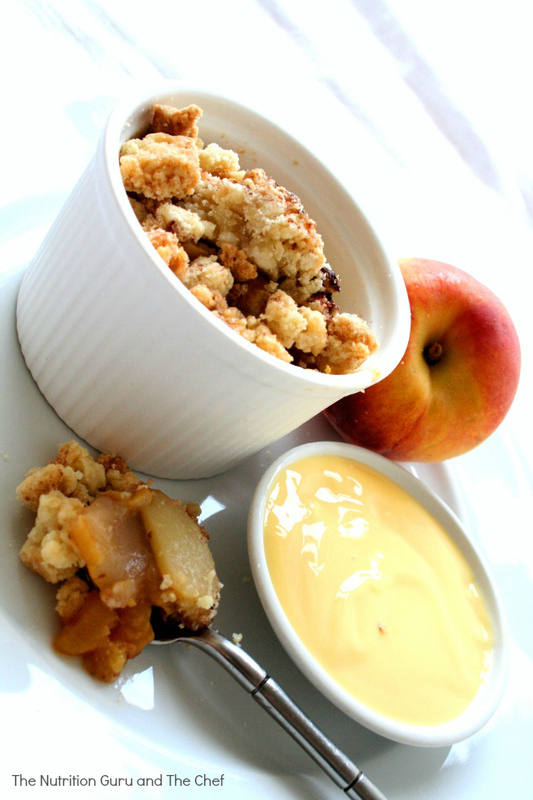 The crumble should turn crisp and golden on top, and the fruit be bubbling underneath. Use peaches and pears, apples and pears, nectarines and apples, plums and apples, plums and nectarines…the combinations are endless. Tinned fruit in natural juice or frozen berries can also be used. Before baking sprinkle the crumble with 1/2 cup coconut flakes.